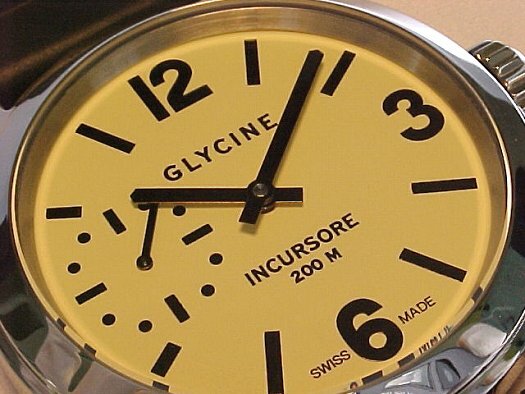 I had an opportunity recently to spend a few days with Glycine’s newest addition to the Incursore line, the 200 M. The name refers to this model’s 200 meter water resistance rating. 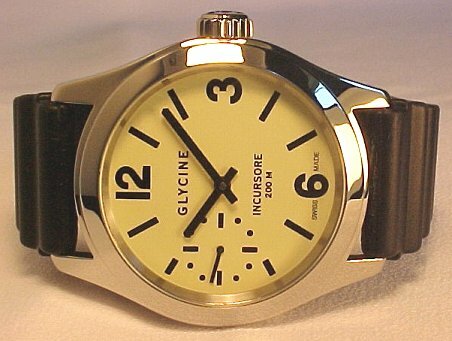 This 200 M has the ivory dial, which is a pale yellow, with non-luminescent black hands and numbers. Daytime and low light legibility are excellent. Black and blue dials are also available, with tritium hands and numbers that are strongly luminescent. 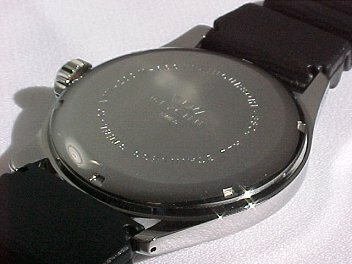 The dial is well executed with crisp stenciling. The 200 M is available only in stainless steel. The case is highly polished and well finished, particularly in view of the price. The watch measures 46 mm in diameter not including the crown and 11.5 mm thick with the steel back and 12.1 mm thick with the display back. The flat, beveled crystal is hardened K-1 mineral glass, with no anti-reflective coating. The crown, which measures 9 mm in diameter, does not screw down, but is protected by double o-rings. Hand winding is smooth and easy. The 200 M uses the Unitas 6497 manual winding movement. 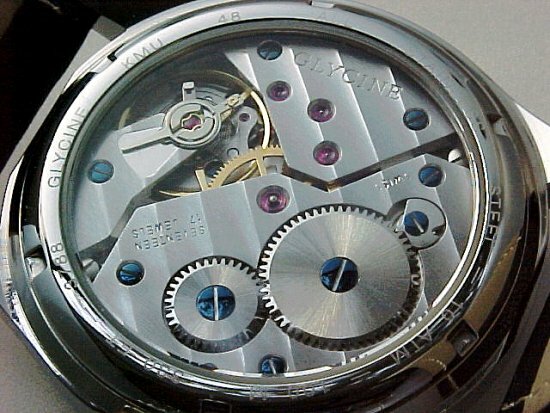 The movement is pocketwatch size:36.6 mm in diameter. 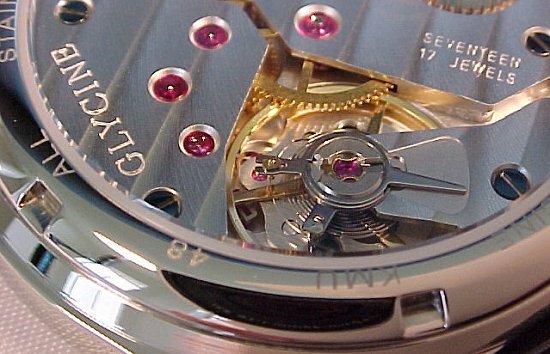 The balance wheel is three spoke made of nickel/guilt and the balance spring is a flat Nivarox 2. The balance wheel oscillates at 18,000 vph and is protected by Incabloc shock protection. The seconds do not hack. 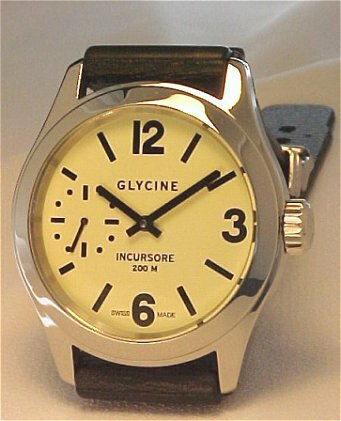 With its oversized mainspring, the autonomy is 56 hours. 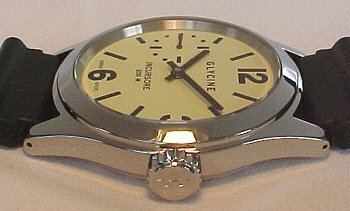 This watch is available with either a standard UT 6497 movement, or a Côte de Genève execution, which has been photographed on a prior occasion in the KMU 48, shown below. This 200 M came with the rubber divers strap, which I feel compliments the watch well. 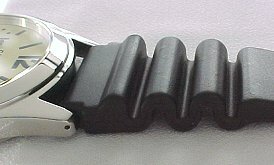 This strap is extra long so that it will fit over a wetsuit. 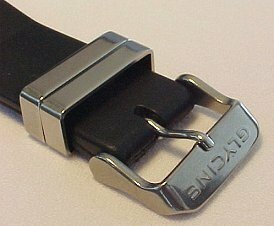 The strap is of standard configuration, with independent stainless steel retainers for the strap end. 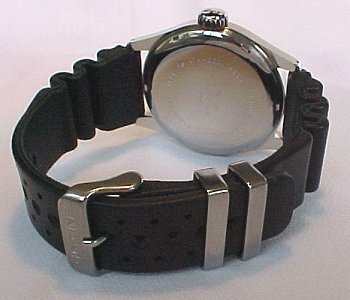 The 200 M is available with ivory, black and blue dials, and with steel bracelet, rubber strap or leather strap. The case and steel bracelet are available in polished, satinated or sandblasted finishes. The USA list prices are: bracelet $518, rubber strap $449, and leather strap $434. 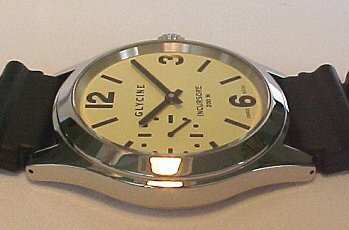 Add $25 for the display back, and add $150 for the Côte de Genève decorated movement.